The province of Alberta fully embraced federal legalization and as a result, their retail cannabis scene is thriving. From locally-owned and operated shops to national retailers, Albertans and those who pass through have a wide array of awesome cannabis shops to choose from. 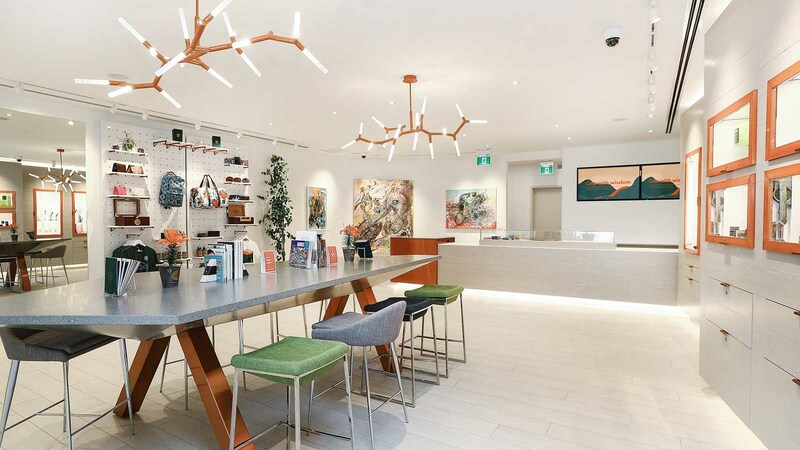 We’ve compiled a list of 10 must-see cannabis retail stores in Alberta. Unique in their own regard, they all have a mission of offering high-quality cannabis product, an enjoyable customer experience, and modern design in common. Whether you’re a cannabis newbie or a longtime connoisseur, you’ll be impressed. Fire and Flower is one of the larger retail cannabis chains in Alberta, with five stores throughout the province. Each location feels like it could be a part of a futuristic spaceship. Everything is bright white with orange accents throughout, creating a friendly, modern, and chic atmosphere. 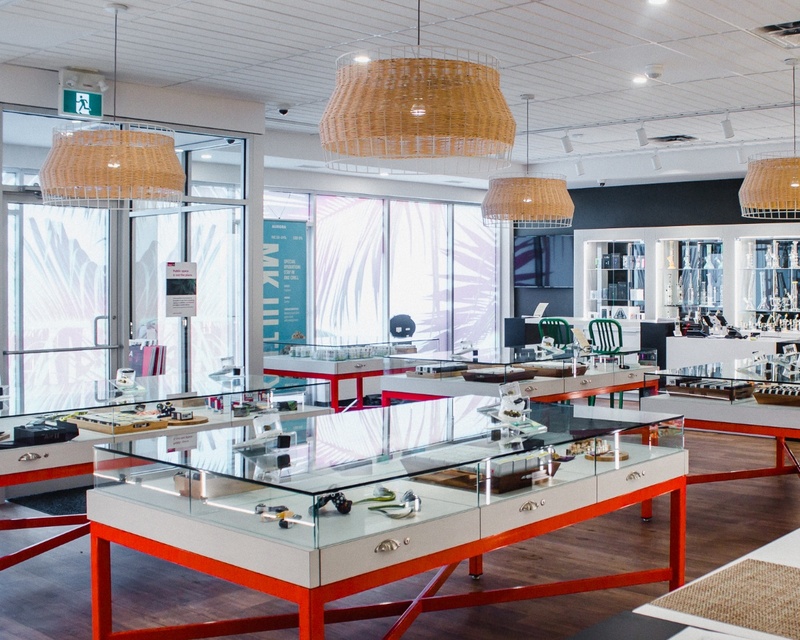 It feels like you’re shopping at a trendy technology store more than a legal cannabis shop. 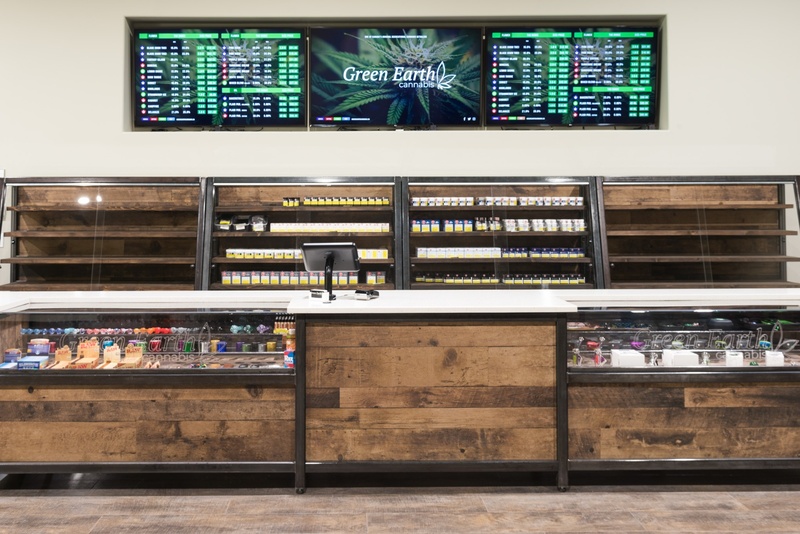 All cannabis strains offered at Fire and Flower are handpicked, with options available for “Beginners, dabblers, and connoisseurs.” And their daily offerings are beautifully and accessibly displayed on digital signage behind the counter. Spiritleaf is absolutely stunning from a design perspective. It doesn’t feel like you’re in a cannabis shop, but rather perusing an upscale clothing boutique. SpiritLeaf combines textures like wood, leather, and metal to create a truly beautiful atmosphere in each of their stores. What we love most is their attention to the customer experience. By providing tablet stations where customers can explore the menu and order their products, guests are able to get in and out without a long line or too much hassle. 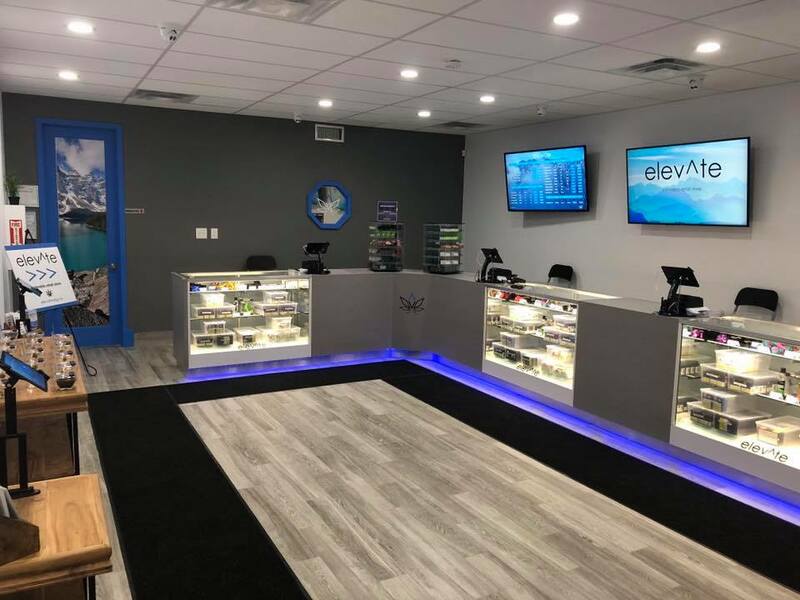 More people than ever will be trying cannabis for the first time thanks to federal legalization in Canada and Elevate, is a retail shop that understands this. That’s why they place such a big emphasis on education and providing a safe, discrete environment for their shoppers. 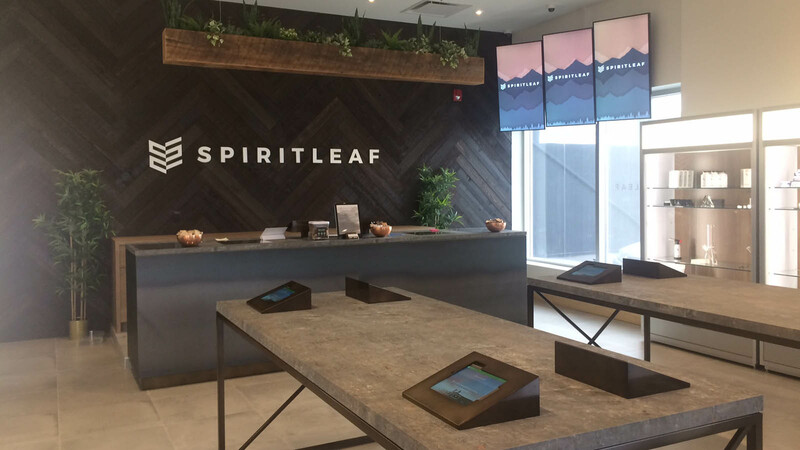 The modern design touches, like cool blue lights below the counter, big digital signage with gorgeous branding, and menu and tablet check out stations, prove that Elevate is quite literally elevating the legal cannabis buying experience in Edmonton. In addition to educating the cannabis newbie and creating a unique experience, Elevate is the first retailer in Alberta to begin an in-house recycling program for all used cannabis containers. So far the initiative, which launched December 2018, has diverted 75lbs of recyclable material from the landfill. Keep it up, Elevate! Green Earth Cannabis is one of the original recreational cannabis retailers in Canada. Their Calgary store is simple, yet modern and efficient. We love the mix of steel, glass, and wood textures in their interior design. Big display cases in and behind the counter make it easy for the customers to see the cannabis flower, oils, and accessories the store offers. 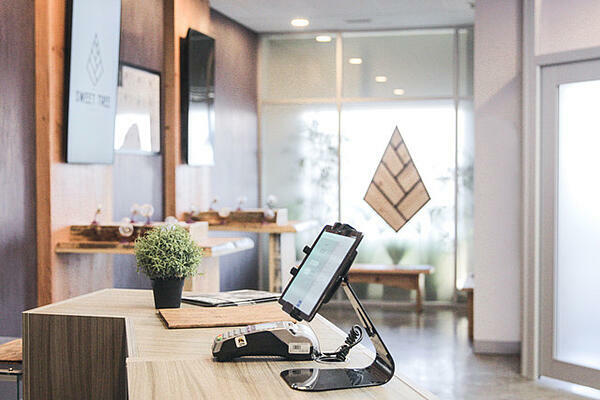 Whether you speak with a knowledgeable Green Earth Cannabis budtender at the counter or if you skip the line and place your order using one of their tablets, every customer is bound to walk away happy. And if you want to do some research before you go in, they provide detailed profiles on their website of each cannabis strain so you can walk in prepared. 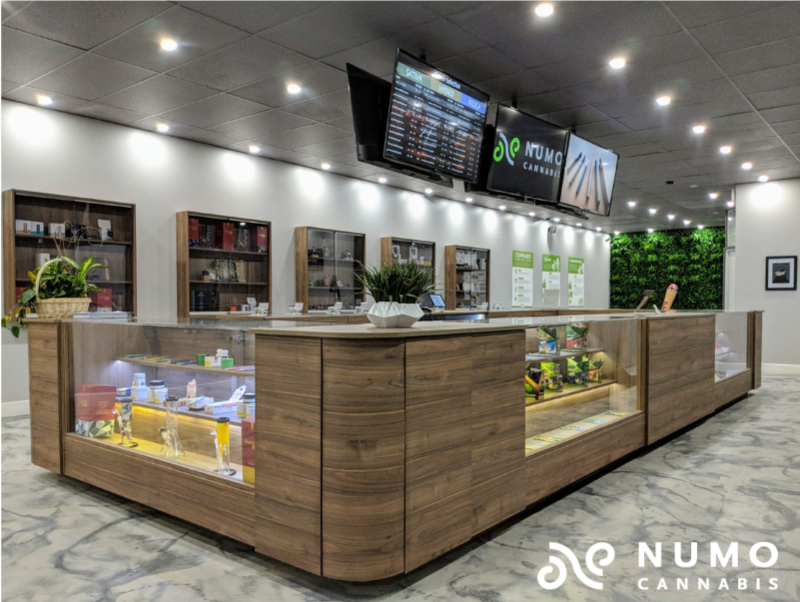 You can find Numo Cannabis right in the heart of central Edmonton. This store has local roots in Alberta and they are dedicated to meeting the needs of their neighbors and community. But that’s not their only principle. They also prioritize selling high-quality cannabis and amplifying cannabis culture. The store itself is beautifully designed, with a four-counter square in the center manned by a friendly staff. This floorplan allows more customers in line to see the well-stocked display cases inlaid in the counters so they are prepared when it’s their time to buy. And for customers far back in the line, Numo also offers six huge digital menus so you can see what they have in stock before you ever approach the counter. If you find yourself in Cold Lake, head over to Clarity Cannabis! Clarity Cannabis loves being a part of their local community, making it a centerpiece of their company’s mission. Clarity Cannabis seeks to bring their community together and support the members of that community by providing connection and mindful well-being. Alberta’s cannabis customers are a diverse group and Clarity wants to make sure the buying process is easy and enjoyable for everyone, no matter where they fall on the spectrum. Clarity Cannabis, as the name suggests, is serious about taking the confusion out of cannabis. Their team is a case study on having a knowledgeable and friendly staff. They are able to field questions from the most knowledgeable cannabis customers to the least experienced. As you approach either of two Sweet Tree Cannabis stores in Calgary, you’ll notice a cool window display with the whimsical phrase, “Life can be this sweet.” This pleasantry sets the tone as you shop the store. Inside, the retailer’s cannabis flower offerings are on display. A nug of each type is placed inside of a unique display container that allows customers to smell it and see it under a magnifying glass. This helps customers know exactly what they’re getting. Their proprietary cannabis blends are categorized in four ways: earth (for alert relaxation), moon (for sleep), stars (for creativity and conversation), and sun (for a daytime mood boost). But cannabis flower isn’t all Sweet Tree offers; they’ve also got pre-rolls, oil drops, and capsules. Canndara is establishing itself as a national franchise, opening stores all across the country… including Edmonton! They pride themselves on providing high quality, consistent cannabis in their warm and inviting stores. Just because Canndara is a national chain doesn’t mean they skip out on the small details though. We love that they curate special Spotify playlists that you can listen to while enjoying their cannabis products because nothing goes better with good music! Besides having one of the catchier names in cannabis retail, Canna Cabana has stores throughout Alberta (Edmonton, Whitecourt, Lethbridge, and Calgary) and many more on the way. Their shops have a more classic cannabis retail/smoke shop feel, but with a modern update. Huge glass display cases all throughout the stores show off the great cannabis products and accessories they have in stock. And they get major bonus points for creating their own in-house recycling program so all that plastic packaging gets put to good use instead of a landfill. This locally owned and operated retail cannabis shop in Devon, Alberta feels like walking into your favorite neighbor’s living room. Small Town Buds is a cozy and simple store with all the right design touches, like rich wood paneling, large glass display cases, digital signage, an exposed brick wall, and even a sliding barn door! We love their wall art of beautiful and informative posters explaining cannabis, from its flavors to the science behind how it affects us. Stop in to snag high-quality cannabis flower and CBD products while you’re in Devon! The legal cannabis industry in Canada is growing quickly and retailers are rising to meet the occasion. We hope you find these Alberta retail cannabis locations as impressive, modern, and friendly as we do. For more news and insights on retail cannabis in Canada subscribe to our blog, or check out our Alberta dispensary laws page for all the rules and regulations you need to know!